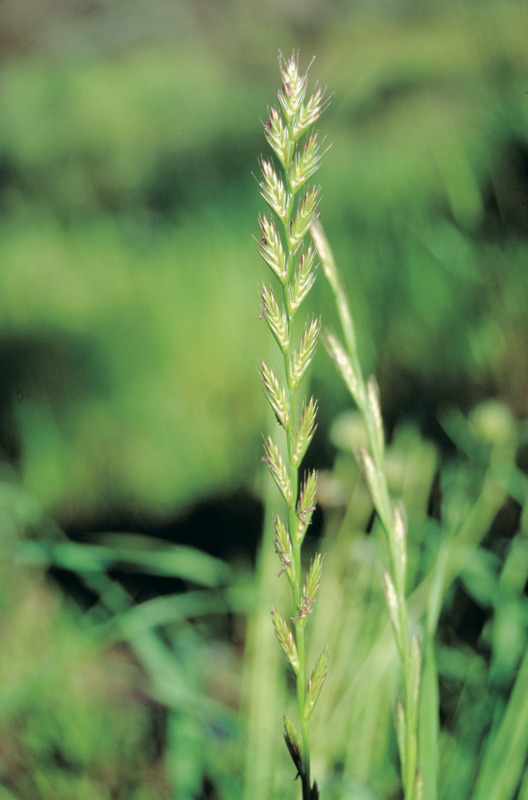 Annual ryegrass (Lolium rigidum) is one of the most serious and costly weeds of annual winter cropping systems in southern Australia. Annual ryegrass is highly competitive and can compete with a crop as early as the two-leaf crop stage. It is a winter to spring growing weed that can emerge from late autumn through to early spring. The number of emergence flushes and the density of plants that emerge are related to initial seedbank levels and the frequency and amount of rainfall. Annual ryegrass is hairless and has bright green, narrow leaves. The leaves are shiny, especially on the back of the blade. It has a wide ligule, long auricles and the emerging leaf is folded. The base (below ground) is often reddish purple in colour and seedlings exude a clear sap when crushed. Mature plants are erect and up to 900 millimetres (mm) in height. The inflorescence (flowering stems) are flat and up to 300mm in length. Spikelets have 3-9 flowers and the husk is almost the same length as the spikelet. Seeds are relatively flat, 4-6mm long, 1mm wide and straw-coloured, with the seed embryo often visible through the outer layers. They are held securely to the flower stem and significant force is needed to detach them either as individual seeds or as part of the flower stem. Annual ryegrass is a winter to spring growing weed that can emerge from late autumn through to early spring. Ideal conditions for germination of annual ryegrass include a significant autumn/winter rain event and seeds located 20mm deep in the soil. Germination reduces with increasing seed depth, stopping at about 100mm. Most shallow seed will germinate during autumn and early winter. The peak germination (80% of seeds) occurs at the break-of-season after the first two falls of rain that exceed 20mm. Newly-formed seeds of annual ryegrass are dormant for the first 8-9 weeks. Less than 1% carryover of viable residual seed remains after late winter in undisturbed soil, indicating that the seed is relatively short-lived. Why is it a major weed? As one of the most serious and costly weeds in southern Australia's winter cropping systems, annual ryegrass produces an extremely high number of seeds per plant. Dense stands (>100 plants/m2) can produce up to 45 000 seed per square metre under ideal conditions. Annual ryegrass is highly competitive and can compete with crops as early as the two-leaf crop stage. Annual ryegrass also is a host for the bacteria Clavibacter spp., which cause annual ryegrass toxicity (ARGT) and can be infected by ergot fungus. Many populations of annual ryegrass have developed resistance to both selective and non­-selective herbicides. Repeated use of herbicides from the same mode-of-action group (particularly the high-risk Groups A and B) have lead to herbicide-resistant individuals. Annual ryegrass has developed resistance to the following mode-of-action herbicide groups in Western Australia. There are now more than 23 confirmed cases of glyphosate-resistant ryegrass populations in Australia mostly from cropping paddocks. There are at least three populations recorded in WA. There has also been a recent case of resistance to paraquat in annual ryegrass been found in South Australia.